Is there a Walser costume? Originally, costume means "the clothes worn". The costumes developed differnetly in the distinct regions. What does the Romantic term “national costume” mean? Surely not “the clothing that is particular to and was created by peasantry ever since” as some sources say. For costume is alive and subject to change, even though it followed this change only slowly and partly. The eldest displays of costumes are to be found on gravestones of the Romanised Celtic population. Among other things, women in Rätien wore a headpiece called “Modius” until the 6th century. 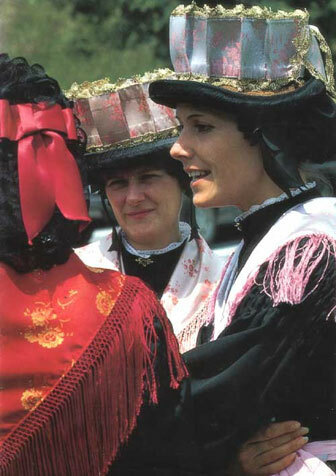 The black, precision-fold “Juppe” (costume) goes back to the mediaeval corsolet. The skirt which was fixed with straps could reach under the armpits or just up to the hips. This skirt counts to the first female clothing. The way the Kleinwalsertal’s female costumes were cut (high-waisted) was common in Mediaeval Ages. The first signs of a peasant costume can be seen as from the 16th century. During the Mediaeval Ages this costume differed from the clothes in town because of its cut, the rough-textured material, the missing jewellery, the predominately grey colour and the rough headpieces and shoes. The beginning of modern times intensified the social differences between nobleman- townsman- peasant and the German Reich’s sectionalism promoted the emerging of local differences. Thus, the bourgeois as well as the peasant costume separated from the courtly costume. The opposites of rural and urban costumes appeared only after the French Revolution of 1789 abolished all class differentiations. The great freedom was welcomed and used in costumes. Finally, it was allowed to wear colours as liked and to lift the class consciousness with gold. Between 1780 and 1830, the so called “valley-costume” developed and outside the valleys the regional and sometimes also the local costumes. At the same time, the unwritten law exists that each community thrives to maintain their characteristics and that nothing is taken over or absorbed in other regions. The costume became a demonstration of identity; it works as a document of belonging and is still seen as a signal of identity to the outside. 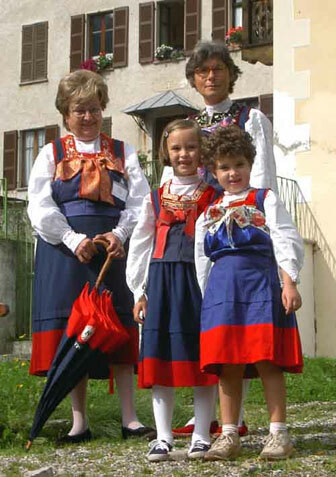 The Walser costumes are full of the joys of life, colourful and manifold.